Photodynamic Therapy (PDT) is a technique for treating skin cancers and sun damaged skin which might one day turn cancerous (pre-cancers). 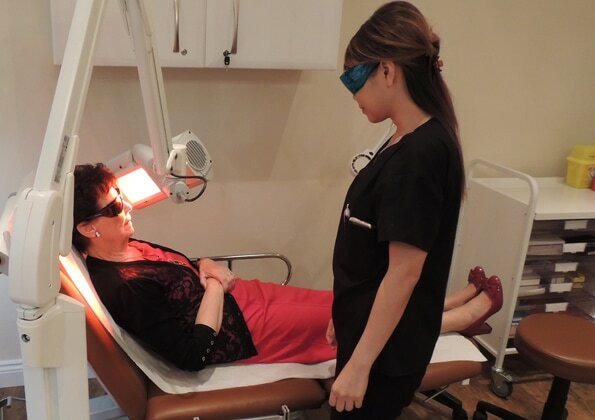 In PDT a special light activates a cream which has been applied to the lesion (affected area of skin). This treatment kills the abnormal cells in the skin. PDT involves the use of a light-sensitive chemical (called a photosensitiser). This photosenstitiser is, by itself, harmless. When a light of a certain wavelength (usually red light) is shone onto skin to which the photosensitiser has been applied, the photosensitiser is activated. This causes changes in the oxygen molecules within the sun-damaged skin cells. These "excited" oxygen molecules kill the cells. Only the area of skin exposed to the light source will be affected and inflamed; after the inflammation clears it should be cured.